First published in 2000, "Journey for Life details the story of Perry Wellness Center founder Stuart Perry's thousand-mile walk from Americus, Georgia to Chicago, Illinois. The 1998 trip was undertaken to bring attention to the problem of depression and to urge the American Medical Association to promote greater screening efforts for this disease. The three-month walk brought national attention to mental illness through a unique form of grass roots advocacy. 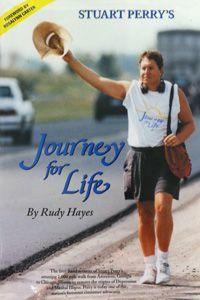 Authored by retired newspaper editor and mental health advocate Rudy Hayes, "Journey for Life" remains a classic advocacy story. it is also a powerful personal memoir about one man's own journey from suicidal depression to award-winning mental health leadership. To buy fresh flowers and produce...check often for seasonal specials. Coming soon -- Perry Wellness Center tee shirts and caps for sale!